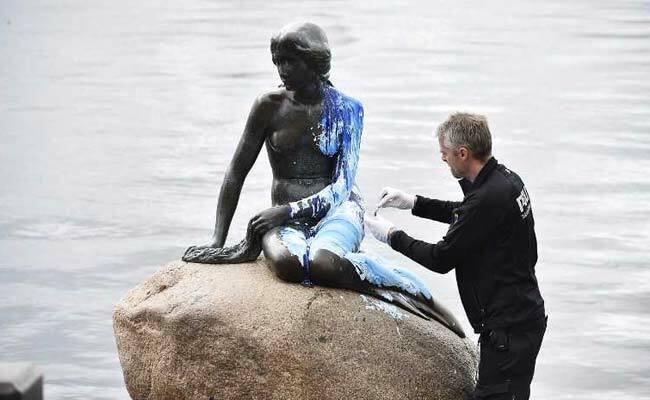 The Little Mermaid statue in Copenhagen, the city's most famous monument, was on Wednesday vandalised for the second time in just over two weeks, police said. A policeman secures evidence at the vandalised Little Mermaid statue in Copenhagen. The bronze statue had been doused in red on May 30 by activists outraged over whaling. And on Wednesday, she was smothered in blue and white paint, the Copenhagen police said on its Twitter account, adding they were looking for a "slim girl with fair hair". "Befri (sic) Abdulle", or "Free Abdulle" in English, had been written on the ground in front of the statue, which is perched on a rock by the waterside. The police did not elaborate further on the writing, which appears to refer to Abdulle Ahmed, a 36-year-old Somali citizen in Denmark who has allegedly been given forced medication for more than a decade at a psychiatric hospital over reported violence against caregivers. The high-profile case has sparked outrage in the Nordic nation and Somalia's ambassador to the Benelux and the European Union has hired a lawyer to help return Ahmed to his native country, according to local media. The Little Mermaid, inspired by a character in Danish poet and author Hans Christian Andersen's 1837 fairytale of the same name, is a 175-kilogram (385-pound) statue by Edvard Eriksen. She was commissioned in 1909 by Carl Jacobsen, the son of the founder of the famous Carlsberg brewery, and has been one of Denmark's main tourist attractions since 1913. The statue has been vandalised numerous times over the years, including when the mermaid's head was stolen in 1964 and 1998, as well as when an arm was cut off in 1984.